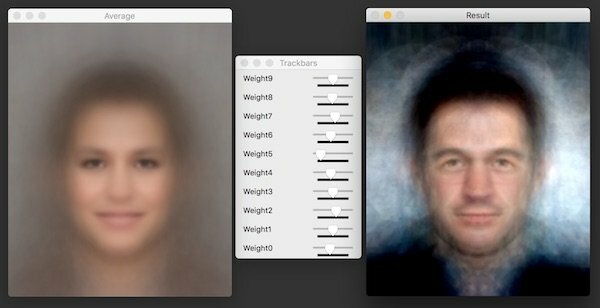 In this post, we will learn about Eigenface — an application of Principal Component Analysis (PCA) for human faces. We will also share C++ and Python code written using OpenCV to explain the concept. The video below shows a demo of EigenFaces. The code for the application shown in the video is shared in this post. In our previous post, we learned about a dimensionality reduction technique called PCA. If you have not read the post, please do so. It is a pre-requisite for understanding this post. Figure 1: The principal components of 2D data (red dots) are shown using the blue and green lines. To quickly recap, we learned that the first principal component is the direction of maximum variance in the data. The second principal component is the direction of maximum variance in the space perpendicular (orthogonal) to the first principal component and so on and so forth. The first and second principal components the red dots (2D data) are shown using blue and green lines. are scalar multipliers we can choose to create new faces. They can be positive or negative. Figure 2 : On the left is the mean image. On the right is a new face produced by adding 10 Eigenfaces with different weights (shown in center). Eigenfaces are calculated by estimating the principal components of the dataset of facial images. They are used for applications like Face Recognition and Facial Landmark Detection. In the previous post, all examples shown were 2D or 3D data points. We learned that if we had a collection of these points, we can find the principal components. But how do we represent an image as a point in a higher dimensional space? Let’s look at an example. A 100 x 100 color image is nothing but an array of 100 x 100 x 3 ( one for each R, G, B color channel ) numbers. Usually, we like to think of 100 x 100 x 3 array as a 3D array, but you can think of it as a long 1D array consisting of 30,000 elements. You can think of this array of 30k elements as a point in a 30k-dimensional space just as you can imagine an array of 3 numbers (x, y, z) as a point in a 3D space! How do you visualize a 30k dimensional space? You can’t. Most of the time you can build your argument as if there were only three dimensions, and usually ( but not always ), they hold true for higher dimensional spaces as well. To calculate EigenFaces, we need to use the following steps. Obtain a facial image dataset : We need a collection of facial images containing different kinds of faces. In this post, we used about 200 images from CelebA. Align and resize images : Next we need to align and resize images so the center of the eyes are aligned in all images. This can be done by first finding facial landmarks. In this post, we used aligned images supplied in CelebA. At this point, all the images in the dataset should be the same size. Create a data matrix: Create a data matrix containing all images as a row vector. If all the images in the dataset are of size 100 x 100 and there are 1000 images, we will have a data matrix of size 30k x 1000. 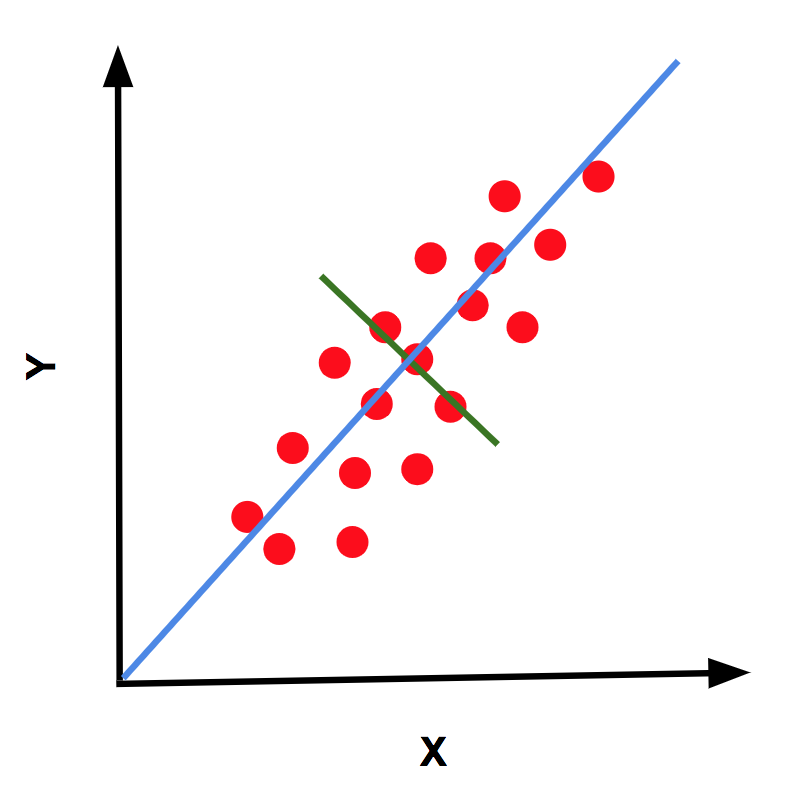 Calculate Mean Vector [Optional]: Before performing PCA on the data, we need to subtract the mean vector. In our case, the mean vector will be a 30k x 1 row vector calculated by averaging all the rows of the data matrix. The reason calculating this mean vector is not necessary for using OpenCV’s PCA class is because OpenCV conveniently calculates the mean for us if the vector is not supplied. This may not be the case in other linear algebra packages. Reshape Eigenvectors to obtain EigenFaces: The Eigenvectors so obtained will have a length of 30k if our dataset contained images of size 100 x 100 x 3. We can reshape these Eigenvectors into 100 x 100 x 3 images to obtain EigenFaces. The PCA class in OpenCV allows us to compute the principal components of a data matrix. Read the documentation for different usages. Here we are discussing the most common way to use the PCA class. data The data matrix containing every data point as either a row or a column vector. If our data consists of 1000 images, and each image is a 30k long row vector, the data matrix will of size 30k x 1000.
mean The average of the data. If every data point in the data matrix is a 30k long row vector, the mean will also be a vector of the same size. This parameter is optional and is calculated internally if it is not supplied. flags It can take values DATA_AS_ROW or DATA_AS_COL indicating whether a point in the data matrix is arranged along the row or along the column. In the code we have shared, we have arranged it as a row vector. Note : In the Python version, you do not have the option of specifying this flag. The data needs to have one image in one row. maxComponents The maximum number of principal components is usually the smaller of the two values 1) Dimensionality of the original data ( in our case it is 30k ) 2) The number of data points ( e.g. 1000 in the above example ). However, we can explicity fix the maximum number of components we want to calculate by setting this argument. For example, we may be interested in only the first 50 principal components. Calculating fewer principal components is cheaper than calculating the theoretical max. In this section, we will examine the relevant parts of the code. The credit for the code goes to Subham Rajgaria . He wrote this code as part of his internship at our company Big Vision LLC. Let’s go over the main function in both C++ and Python. Look for the explanation and expansion of the functions used after this code block. // Size of images. All images should be the same size. // Create data matrix for PCA. // You can reset the sliders by clicking on the mean image. # Create data matrix for PCA. # You can reset the sliders by clicking on the mean image. The above code does the following. Set the number of Eigenfaces (NUM_EIGEN_FACES) to 10 and the max value of the sliders (MAX_SLIDER_VALUE) to 255. These numbers are not set in stone. Change these numbers to see how the application changes. Read Images : Next we read all images in the specified directory using the function readImages. The directory contains images that are aligned. The center of the left and the right eyes in all images are the same. We add these images to a list ( or vector ). We also flip the images vertically and add them to the list. Because the mirror image of a valid facial image, we just doubled the size of our dataset and made it symmetric at that same time. // Allocate space for all images in one data matrix. // w = width of an image in the dataset. // h = height of an image in the dataset. // 3 is for the 3 color channels. // numImages = number of images in the dataset. Allocate space for all images in one data matrix. w = width of an image in the dataset. h = height of an image in the dataset. 3 is for the 3 color channels. Calculate PCA : Next we calculate the PCA using the PCA class in C++ (see lines 19-23 in the main function above) and the PCACompute function in Python (see line 23 in the main function above). 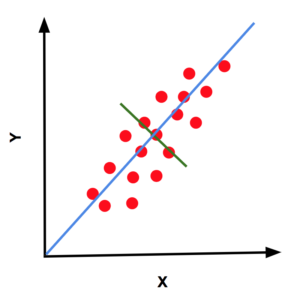 As an output of PCA, we obtain the mean vector and the 10 Eigenvectors. Reshape vectors to obtain Average Face and EigenFaces : The mean vector and every Eigenvector is vector of length w * h * 3, where w is the width, h is the height and 3 is the number of color channels of any image in the dataset. In other words, they are vectors of 30k elements. We reshape them to the original size of the image to obtain the average face and the EigenFaces. See line 24-35 in the C++ code and lines 26-32 in Python code. Create new face based on slider values. A new face can be created by adding weighted EigenFaces to the average face using the function createNewFace. In OpenCV, slider values cannot be negative. So we calculate the weights by subtracting MAX_SLIDER_VALUE/2 from the current slider value so we can get both positive and negative values. // OpenCV does not allow slider values to be negative. OpenCV does not allow slider values to be negative. Very informative demo. Use of colour components in the data, has brought newer meaning to Eigen faces. Thanks very much! Well, the demo worked flawless under a nanopi fire2 (same RAM sizeas a RPi3). “Only” 147 images were kept, in order to comply with RAM constraints. True. Thanks for the test on RasPi3. Well, nanoPi fire2 is 30% smaller than RPi3 (has the same RAM size, but RPi3 has a little swap partition and graphical RAM can be configured) : performances would be a little “better” with a RPi3. One could use the full set of photos, once downsampled, without RAM starvation (and results did not differ much from the 150 photo set, or the full resolution 150 photo set)…. other progran reads the ASCII (should be MIME64; unpleasant to debug) (xml/yml) file, and copes with the sliders. Yes, that is exactly what I am doing for my next post — sharing a model file ( mean / eigenvectors ) instead of the images. I wish OpenCV had a binary format so the file size was more manageable. Well, I did not think of writing a binary file…. yml/xml then should countain “only” : name of the element, , its dimensions, the name of the binary file, the offset (bytes to skip to read the elements), the length to be read…. Thanks, Jeet. Thanks for the suggestion. We will put that on our list of potential posts. you wrote “They are used for applications like Face Recognition, Facial Landmark Detection and”. What is this after “and”? Sorry that was a typo. It is fixed. In general many computer vision algorithms use PCA as a preprocessing step for dimensionality reduction. Hi Satya, correct me if I’m wrong, but I don’t think openCV handles the “dimensionality trick” right? so it would actually calculate the eigenvector of the 30k by 30k matrix instead of applying the “dimensionality trick” stated in the paper that will reduce the computational complexity to M, where M is the number of images. Let me know if you need more clarification and also thanks for sharing the code!